Animal Defenders International : Publications : Exposed! 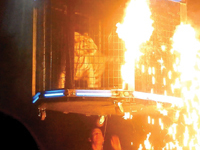 Las Vegas was once dominated by acts featuring lions and tigers, but now just one remains – Dirk Arthur’s ‘Wild Magic’ show. ADI’s new video shows the extreme confinement and deprivation suffered by the animals used as props in the show. White tigers, a snow leopard and panther appear for minutes on-stage but endure around six hours a day in tiny crates. When not performing, 13 exotic cats are housed in small enclosures in Dirk Arthur’s backyard. Arthur has been cited numerous times by the United States Department of Agriculture (USDA) for violations of the Animal Welfare Act, including failure to provide adequate veterinary care after he declawed two juvenile tigers and a lion. ADI is urging the Westgate Las Vegas Resort and Casino to cancel the show. 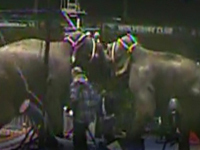 An ADI investigator working undercover inside Jordan Circus World filmed two out of control elephants begin to fight as circus workers desperately tried to stop them in Utah. Trainer Habib Omar and another elephant groom beat the elephants with bullhooks but Isa the elephant charges into an elephant, believed to be called Bunny, easily driving the over two ton animal backwards. Other ADI footage of the elephants performing in Utah, New Mexico, Texas and Oklahoma, shows them being controlled with blows, jabs and electric shocks from a stun gun.